Has there EVER been a NINE-headed MONSTER? By this time next week, the Yankees would have already played their FIRST game of the regular season in Toronto against the Blue Jays, and I am EAGERLY waiting. This blog starts a series of previews leading up to the regular season. Today I am going to preview the Yankees’ batting lineup, while their rotation preview will hit the newsstands tomorrow. Next week I will be previewing the American League and National League before I make my World Series pick next Wednesday right before the games start on Thursday. The Yankees had a great season on offense last season. Aaron Judge had one of the BEST seasons ever for a rookie hitter and that PROPELLED them to Game SEVEN of the ALCS. Complementary players like Didi Gregorious, Brett Gardner, and Aaron Hicks return to the team in 2018 looking to build on last season and take the Yankees to the PROMISED land. Gary Sanchez and Greg Bird had to deal with INJURIES last season, if both players are fully HEALTHY this season then the sky is the limit for both those guys. OH and by the way, the Yankees added Giancarlo Stanton this season, and he LED the National League in Home Runs last season(!!!). Gardy is the LONGEST tenured on the Yankees roster right now and his veteran LEADERSHIP is a big key for this YOUNG team this season. Gardner is a GREAT lead-off hitter who gets on base PLENTY of times for the HEAVY hitters in the lineup. He had his BEST season in the MLB in terms of Home Runs last season and would be SHOCKED if he is able to replicate this season. The ONLY thing Gardner needs to do this season is to have an On-Base Percentage of around .430 then the Yankees will score a LOT of runs. Gardner is a GREAT outfielder so I would not be SHOCKED if he is traded in the middle of the season to fulfill some team needs. Gardner is a MUST HAVE for the Yankees at the TOP of the lineup and if he sets the table correctly, then the Yankees will be GREAT this season. The most IMPORTANT player for the Yankees was Judgie last season, he was the AL Rookie of the Year and carried the team at points during the season. It is going to be really HARD for him to replicate what he did last season. He has a LOT of PRESSURE on him this season and if he gets off to a SLOW start, then the BOO Birds will be flying in Yankee Stadium. If Judge can only do about 75% of what he did last season, then the Yankees will be in great shape with the ADDITIONS of Stanton and Drury to the line up. Judge is the first MONSTER in the Yankees HEART of the lineup, which is going to be DEADLY and if a pitcher struggles with him, then he is going to be DEAD by the time he goes through the MAIZE of the Yankees heart of the lineup. 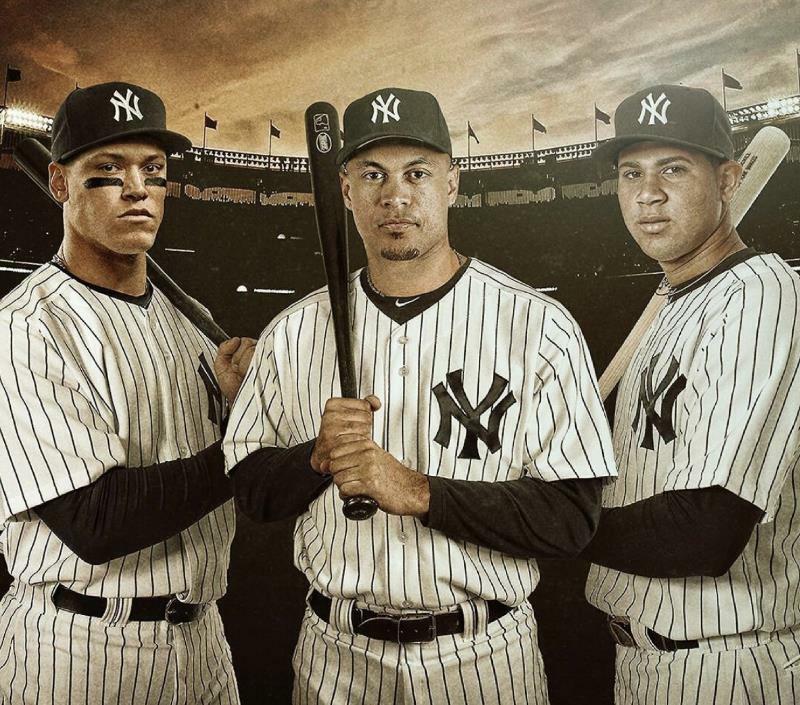 Now this right here is MURDERERS’ ROW folks, if a pitcher is able to get OUT Aaron Judge, then he has to face Giancarlo Stanton before facing the rest of the DEADLY Yankees lineup. Stanton was the NL MVP last season with the Miami Marlins and he is going to be even BETTER in the Yankees with the Short Porch. Stanton should hit about SIXTY-FIVE home runs with the dimensions of Yankee Stadium and as he is going to be the designated hitter for MAJORITY of the season, his only PRIORITY this season is to MASH the ball out of stadiums all season and he is HEALTHY all season then he is going to be a Front-Runner for the AL MVP. The chances of the pitcher getting through Judge and Stanton with no DAMAGE is very SLIM, but if he does, then he still needs to go through ANOTHER gate of HELL to survive and advance. This the THIRD monster of the Yankees lineup and even though the Yankees have no more MONSTER after Gary, their lineup is still DEADLY. Sanchez had a GREAT start to his MLB career in 2016, he was MASHING the ball everywhere and if not for injuries EARLY last season, he is most DEADLY hitter in the Yankees lineup. Sanchez is the most IMPORTANT player for the Yankees this season, between him MASHING in the Yankees middle order and working with the Pitching Staff, if the Yankees have a GREAT regular season, then he will be their candidate for the AL MVP. The Yankees need Sanchez on BOTH sides of the ball, so it would be a real shame if he is the BEST player on the Yankees this season. Didi was DERAILED by the World Baseball Classic last season and he still managed to be the THIRD best hitter on the roster this season. Didi is an UNDERDOG on the team to hit THIRTY or more home runs and if he gets there, then the Yankees should run away with the AL East. Didi is supposed to be the SOFT spot in the Yankees lineup after the THREE-headed MONSTER of Judge, Stanton, and Sanchez, so Didi is an IMPORTANT piece for the Yankees to continue the DAMAGE. He is going to have a GREAT season for the Yankees and I think he is the most OVERLOOKED player on this team. Greg Bird had to SUFFER through injuries all season last year, but still managed to have one of the BIGGEST hits of the season. His home run off Andrew Miller in Game 3 in the ALDS brought the Yankees back from the dead and helped them advance to the ALCS. Bird made his Yankee debut in 2015, while Judge and Sanchez came around in 2016, so most fans FORGET how good Bird was in 2015, which was the last season where he was fully healthy. Thus far this Spring Training, there has been no CONCERNS about his health and that is GREAT news for them. He is going to be the BEST six hitter in baseball, most players with his skill set would be the PRIMARY or SECONDARY option on offense, while he is the FIFTH or SIXTH hitter for the Yankees, so even if he STRUGGLES at times this season, the Yankees should be FINE. Hand up on this one, last season I was really DOWN on Aaron Hicks and I have a BIG egg on my face. Hicks was a GREAT center fielder last season and I think he will built upon that this season. Clint Frazier and Jacoby Ellsbury are breathing down Hicks’ neck for the Center Fielder job, so he has to perform all season long or else he will be replaced by one of the players on the bench. The bottom of the lineup is not REQUIRED to MASH the ball, but the Yankees have some GOOD hitters in that spot who can be GREAT. A KEY addition for the Yankees in the bottom of the lineup is Drury, who should be in the MIDDLE order for MOST teams in baseball, but he is batting EIGHTH. Drury has battled all Spring Training with Miguel Andujar and if he STRUGGLES then he is going to be replaced. He was on my Fantasy Baseball team last season, and he was really GOOD, so based on that ONLY he is going to be the AL MVP, as first reported by ME. I expect to see Andujar and Gleyber Torres be an OPTION for the Third Base spot at times this season, both are really GOOD hitters but need to get better with their GLOVES before they become regular players for the Bronx Bombers. Second Base is the WORST position on the Yankees right now, but the two players that are going to be in the rotation for that position are very experienced for that position. Walker has been a VETERAN player for the Pittsburgh Pirates and he is going to be a VALUABLE player for the Yankees this season. Tyler Wade was not good last season with the Yankees but the organization is hoping that he goes through the same maturation process that Aaron Judge did between 2016 and 2017, if a SIMILAR thing happens to Wade, then the Yankees are a LOCK to Win the World Series this season. Teams do not need ANYTHING from their bench players, but the Yankees have one of their MOST expensive players as their bench player in Jacoby Ellsbury, who is TRASH. Anything that the Yankees get from Ellsbury is a BONUS this season. Frazier and Romine are going to be IMPORTANT replacement players in case the starters get hurt, both had VALUABLE moments last season when the starters were HURT or STRUGGLING. I LOVE Torreyes and even though he is not going to play much this season, if he hits a Home Run this season then I will die from that Joy. That was a look at the GREAT Yankees lineup which is going to try and lead the franchise to their TWENTY EIGHTH championship this season. Tomorrow I will look at the Pitching staff that will complement this Yankee batting order.